Her muse for penning the Eviscerating the Snake series was The Count of Monte Cristo by Alexandre Dumas. 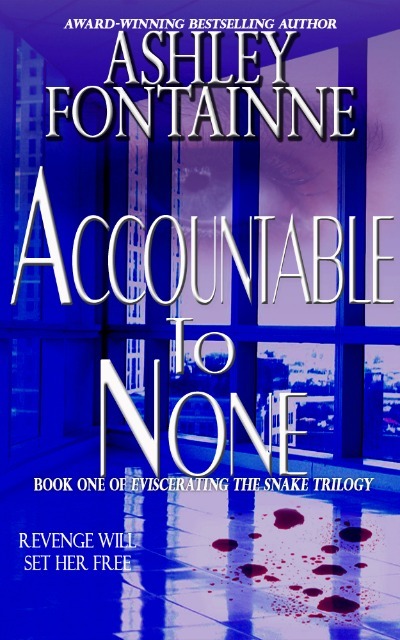 Ashley's love for this book is what sparked her desire to write her debut novel, Accountable To None, the first book in the trilogy. With a modern setting to the tale, Ashley delves into just what lengths a person is willing to go when they seek personal justice for heinous acts perpetrated upon them. The second novel in the series, Zero Balance, focuses on the cost and reciprocal cycle that obtaining revenge has on the seeker. For once the cycle starts, where does it end? How far will the tendrils of revenge expand? Adjusting Journal Entries answered that question: far and wide. Her short thriller entitled Number Seventy-Five touches upon the sometimes dangerous world of online dating. Number Seventy-Five took home the BRONZE medal in fiction/suspense at the 2013 Readers' Favorite International Book Awards contest and is currently in production for a feature film (www.number75themovie.com). Her paranormal thriller entitled The Lie, won the GOLD medal in the 2013 Illumination Book Awards for fiction/suspense. The suspenseful mystery Empty Shell released September 29, 2014. Ashley then delves into the paranormal with a Southern Gothic horror/suspense novel, Growl, scheduled for release in the Spring of 2015. Plus, she will be teaming up with Lillian Hansen (Ashley calls her Mom!) to pen a three-part murder mystery/suspense series entitled The Magnolia Series. The first book, Blood Ties, is due out the Summer of 2015. Nine months ago, Audra Tanner exposed the hidden secrets locked away at the prestigious accounting firm of Winscott & Associates. No one escaped her wrath. And once the smoke had cleared, everyone watched as the diabolical Olin Kemper was led away in handcuffs. Now Audra's meticulous revenge has thrust her into the role of managing partner. But the firm is struggling to survive amidst the turmoil and media attention surrounding the shocking arrest and upcoming murder trial of Olin. And Audra must face the fallout left from her explosive revenge while trying to heal and recover from the trauma of her past. 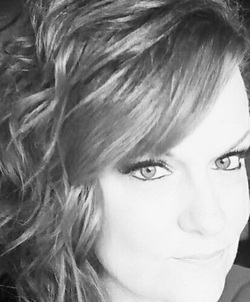 Audra thought she had ended the evil lurking within and that her revenge would set her free. Unfortunately, it's only the beginning. Because evil never dies, it only assumes a new form. Soon everyone at the firm will discover that no one is safe when you are dealing with a psychopath that has zero balance. Three years after the demise of her seventeen year marriage, Mandy Russell decides it's time to jump back into the choppy waters of the dating world. Except there's one problem—the small town she lives in offers few options. Persuaded by her best friend, Mandy reluctantly joins an online dating site. Almost instantly, Mandy meets someone. Someone she connects with. Someone that makes her comfortable. Someone that has dark, sinister plans and desires for her. Unaware of what she's about to encounter, Mandy is off to meet the possible man of her dreams. It will take everything she has to survive the nightmare waiting for her. Will Mandy prevail or will this deadly date be her last?